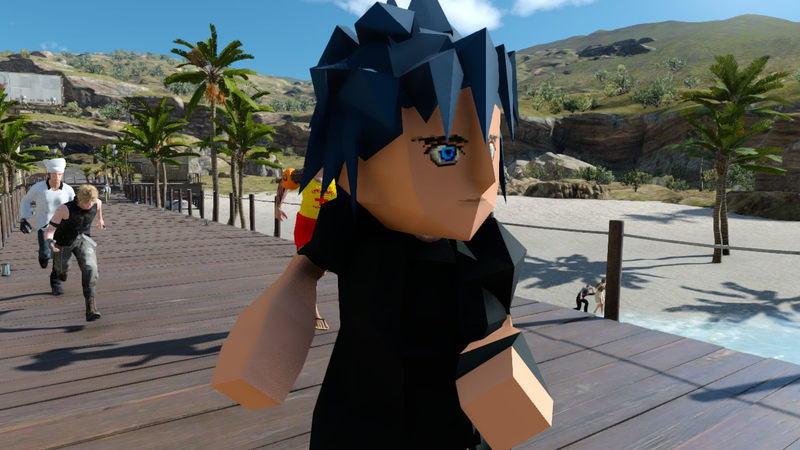 Steam Workshop support for Final Fantasy XV has created some great costume creation opportunities, but this “1997 Retro Noctis Outfit” takes the cake. Modder Kyriya has created some great costumes for the PC version of Final Fantasy XV so far, including Lifeguard Gladiolus and Chef Ignus, but this 1997 skin outdoes those in its sheer gusto for trying to get you to remember Cloud hip tossing that guard during the opening of Final Fantasy VII. It’s also, well, pretty disturbing; there’s nothing creepier than a plastic, jagged being in a photorealistic idyllic realm. The outfit came to be because of a Twitch Q+A session with Noctis voice actor Ray Chase, who responded to a question about what kind of Noctis costume he would like to see with “it would really cool if you could make him like Final Fantasy VII style, the blocky characters.”Of course, the question-asker was Kyriya herself, and so she made it. Now we just need a unique retro costume for every character in a game. I want a herd of giant blocky young adults lunging across the landscape. I need it.